RAT QUEENS #2, from writer Kurtis J. Wiebe and artist Roc Upchurch, has sold out at the distributor level after its first day of release! This marks the second consecutive sell-out for Wiebe and Upchurch's tale of rowdy young adventurers, and is a sure sign that fans alike simply can't get enough of this series. In order to meet reader and retailer demand, RAT QUEENS #2 will be going back to press for a second printing. "Rat Queens #2 is another great issue that has a little bit of everything, and anybody should find something to enjoy about it." "This is a book that feels like it has legs just based on the unique concept alone, but it’s the ability of Wiebe and Upchurch to put pure entertainment on every page and favor strong characters above all else that should make Rat Queens a mainstay on your pull list." "[T]his really is one of the most perfect comic books to come out in recent memory. This character-driven tale is outrageously funny, while still having an interesting story that has real substance to it." RAT QUEENS #2 may still be available in your local comic store while supplies last, and is available digitally on the Image Website (imagecomics.com) and the official Image Comics iOS app, as well as on Comixology on the web (comixology.com), iOS, and Android. 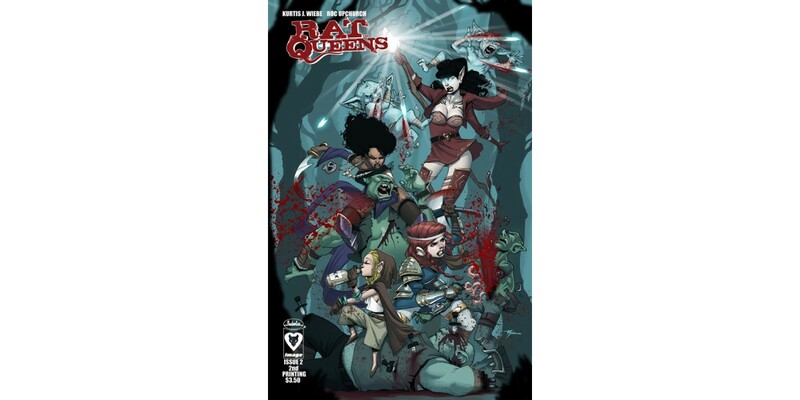 The second printing of RAT QUEENS #2 arrives 11/27 can be pre-ordered with Diamond Code SEP138246. RAT QUEENS #3 also releases on 11/27 and features two covers by Roc Upchurch. Cover A can be pre-ordered now using Diamond Code SEP130629, and Cover B can be pre-ordered using Diamond Code SEP130630.